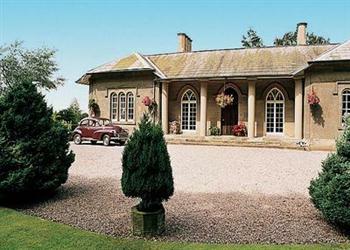 Alstonby Hall in Kirklinton sleeps 4 people. Enjoy a tranquil holiday, in this spacious former shooting lodge built in the 19th century adjoining the owners’ property. Tastefully decorated and furnished, and is set within 3 acres of well-maintained wooded grounds. Trout fishing on a nearby private river. Perfect for fell walking, the Lake District National Park is within an easy drive, with Carlisle and the Scottish borders nearby. Shop and pub 3 miles. 3 steps to entrance. All on ground floor: Living room. Dining room with French doors. Kitchen. 2 bedrooms: 1 double with en-suite shower room and toilet, 1 twin with French doors. Bathroom with roll-top bath and toilet. Open fires in living room and dining room included. Partial Oil central heating (extra charge October - March). Electric, bed linen and towels included. DVD. Aga. Microwave. Laundry service available. Fridge/Freezer. Private lawned garden and furniture. Shared use of 3-acre mature grounds. Ample parking. No smoking please. Holidays run from Friday to Friday. For a better idea of where Alstonby Hall is, you can see Alstonby Hall on the map below. Alstonby Hall is in Cumbria; should you be on the lookout for a special offer, you can find all the special offers in Cumbria. It's always worth checking to see what is on offer at the moment. Do you want to holiday near Alstonby Hall (80036), you can see other cottages within 25 miles of Alstonby Hall; have a look to find your perfect holiday location.